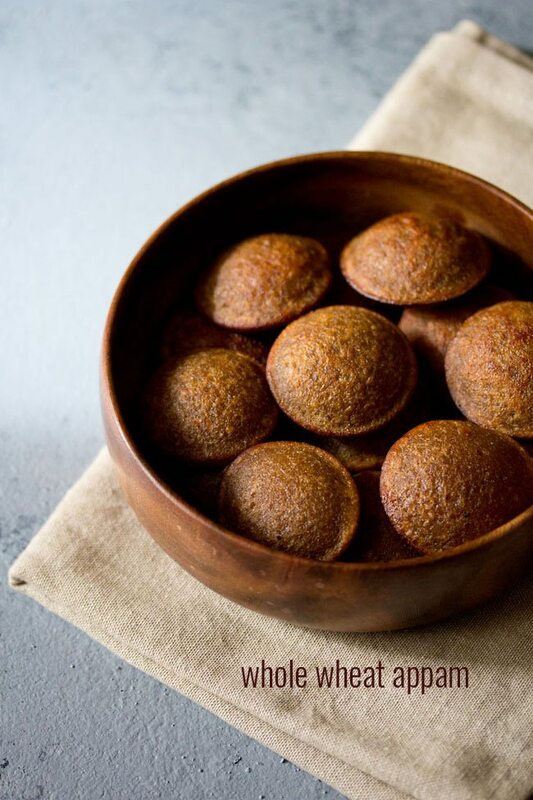 whole wheat flour appam recipe - instant appams made with whole wheat flour, jaggery and bananas. 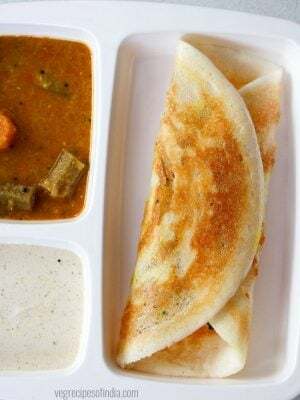 wheat appam recipe with step by step photos – quick sweet appams made with whole wheat flour, bananas and jaggery. 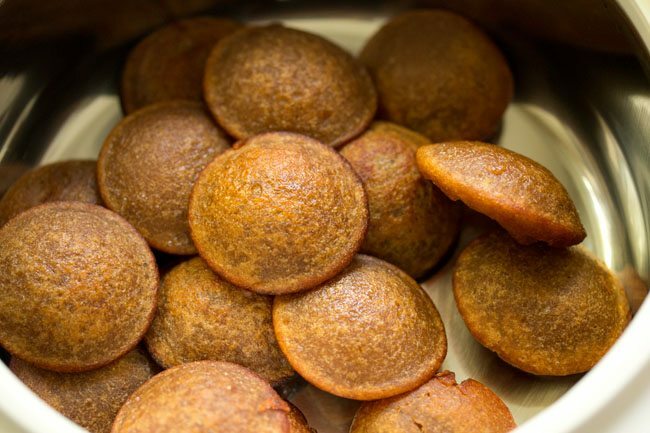 when i had posted banana appam, one of my dear reader friend durga ji was kind enough to share her recipe of whole wheat appams. so yesterday i made these appams with some changes and thought of adding the recipe for ganesh chaturthi. these were really good and soft textured appams. very quick and easy to prepare. 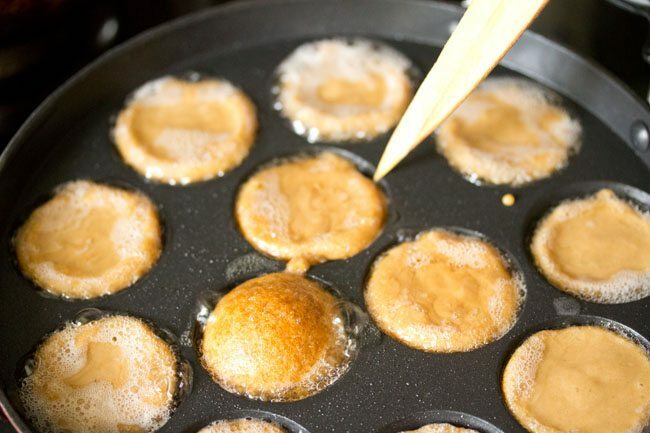 instead of making the appams in the appe pan, you can also fry them in oil. 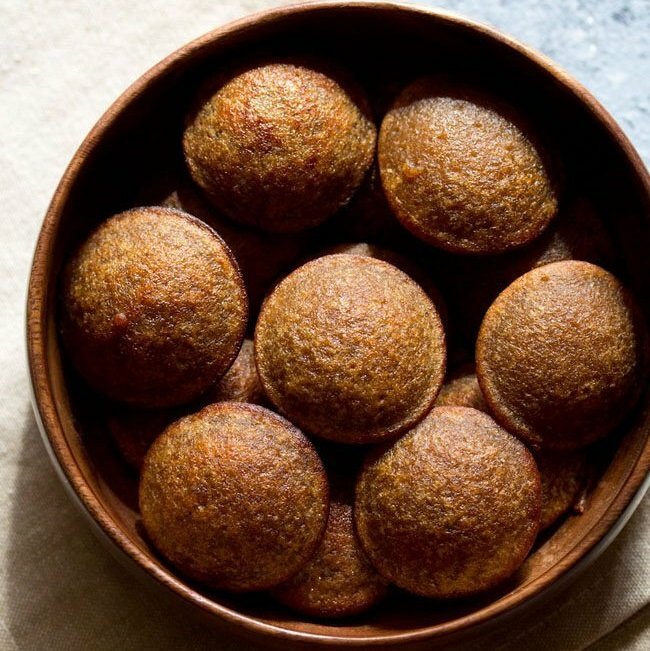 these appams make for a nice evening snack. they stay for a week in the fridge. from the recipe i got about 40 appams. 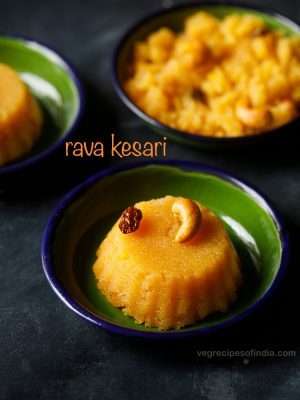 durga ji’s recipe has coconut added in it. i forgot to add coconut. so if using grated coconut, you can add about ¼ cup of it. 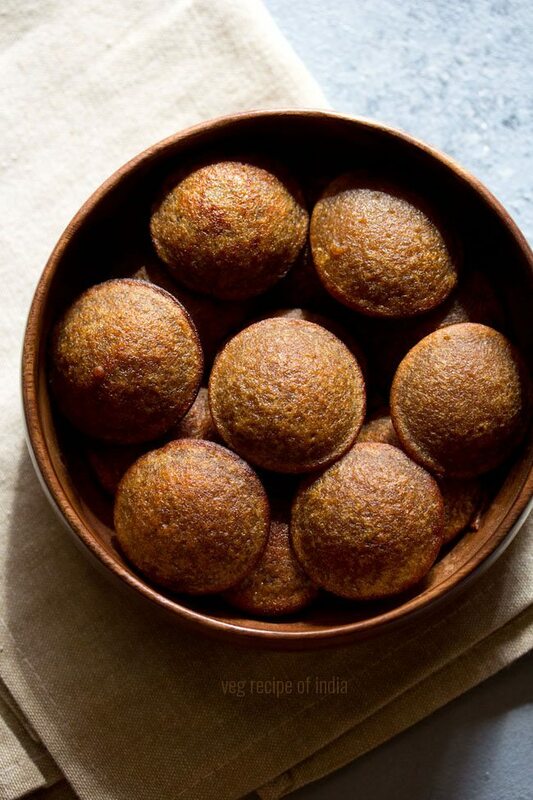 serve the instant whole wheat appams, hot or warm or at room temperature. they are a healthy snack which can be had any time of the day. can also be packed in the tiffin box. in a mixer or blender, take all the ingredients except coconut oil. blend till smooth. you just need to blend till you get a smooth consistency. don't over do. now pour the appam batter in a bowl and allow to rest for 15 minutes. 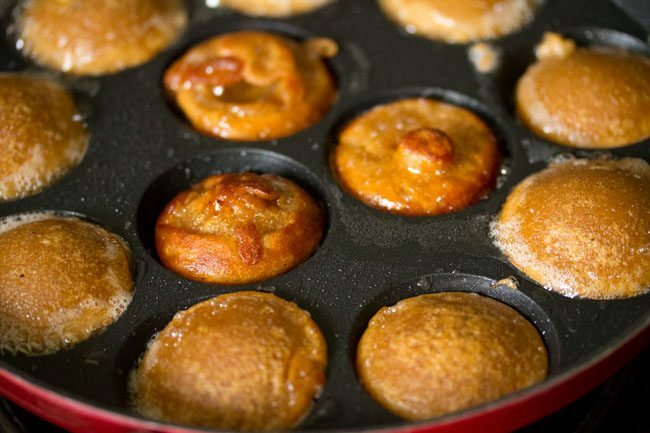 heat a paniyaram chatti or appe pan – Æbleskiver pan. add ½ to 1 teaspoon coconut oil in each mould. instead of coconut oil you can also use ghee. with a spoon, pour the batter till ¾ or more than ¾ in each mould. keep the flame to low or medium and cook the appams. if you want you can cover the pan with a lid. with a wooden/bamboo stick or skewer, turn over the appams which have become golden. do this for the appams which have become golden. 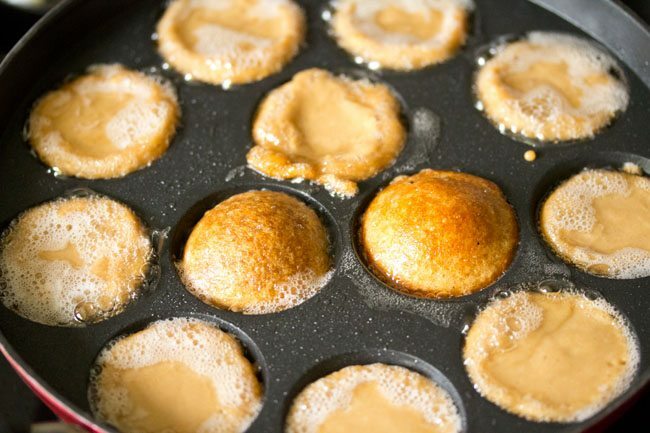 when the rest of the appams are golden, turn them over too and cook all of them till crisp and golden. you can even flip them once or twice back in the same mould for even cooking. once done remove and place them in a casserole. in the casserole wheat appam stay warm for some time. same way prepare the remaining appams. the recipe makes for 40 whole wheat appams. you can store them in an air-tight box or container in the fridge. serve the wheat appams, hot or warm or at room temperature. 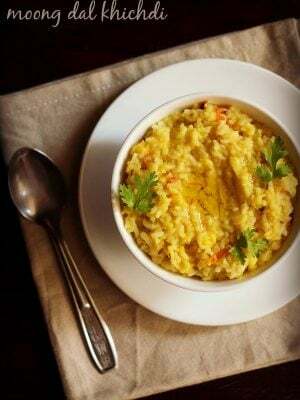 1. you can add ghee or sunflower oil instead of coconut oil. 2. ginger powder can be skipped, if you do not have it. 3. instead of grinding grated coconut in the batter, you can also add it directly to the batter. 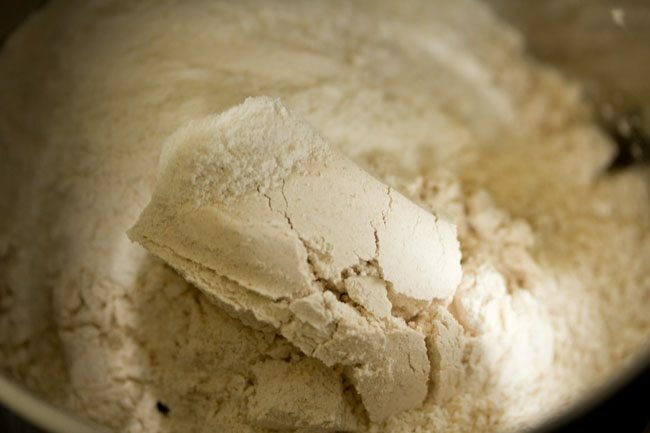 1. in a mixer or blender, take 1 cup whole wheat flour and ¼ cup rice flour. 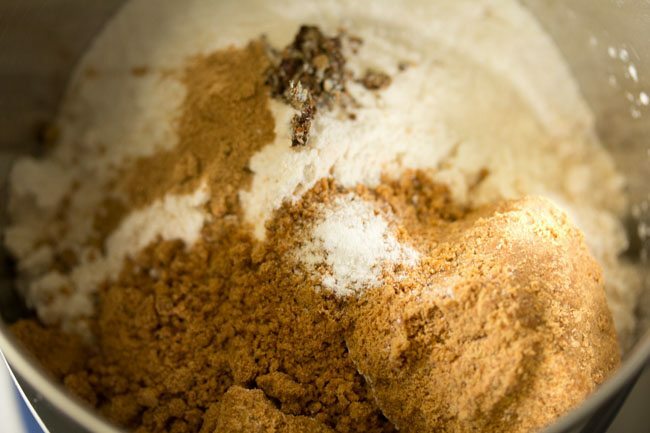 2. then add ½ cup jaggery, ¼ teaspoon cardamom powder, ¼ teaspoon ginger powder and a pinch of baking soda. if the jaggery you use has a lot of impurities, the melt the jaggery in ½ cup water on a low flame. stir till the jaggery melts. then filter and use this syrup. if using this jaggery syrup, then skip step 4, in which water is added. 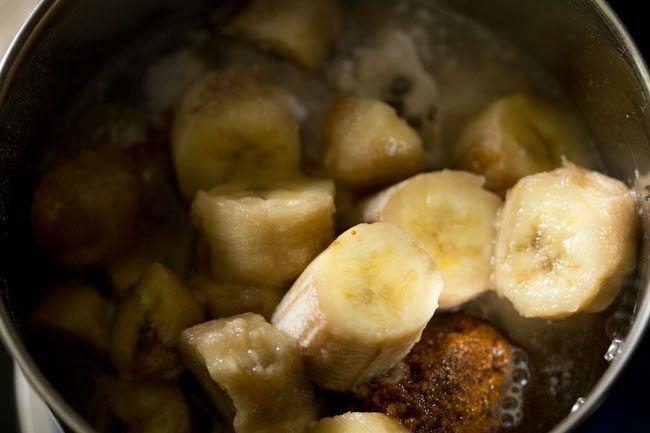 3. next add sliced bananas. 2 medium sized bananas which have been sliced or chopped. the bananas i used were over ripe, but you can use ripe bananas too. 4. add ½ cup water. 5. now blend till smooth. you just need to blend till you get a smooth consistency. don’t over do. 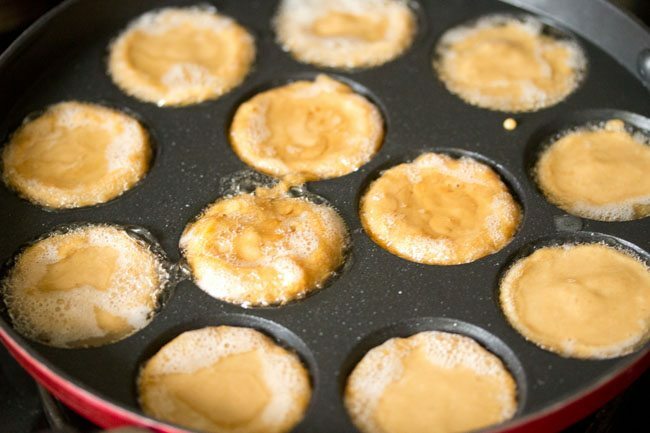 6. now pour the appam batter in a bowl and allow to rest for 15 minutes. 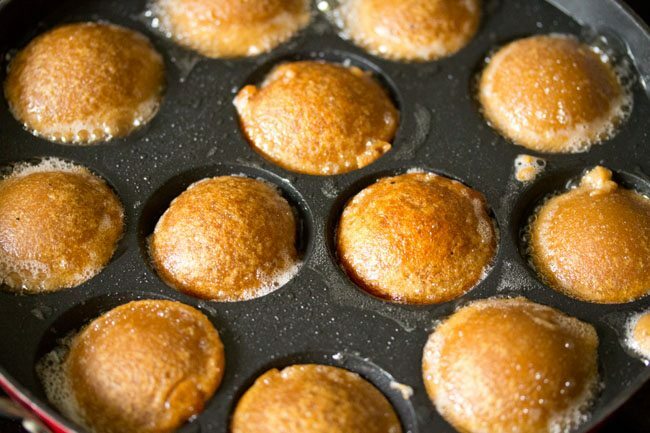 7. heat a paniyaram chatti or appe pan – Æbleskiver pan. add ½ to 1 teaspoon coconut oil in each mould. instead of coconut oil you can also use ghee. 8. with a spoon, pour the batter till ¾ or more than ¾ in each mould. keep the flame to low or medium and cook the appams. if you want you can cover the pan with a lid. 9. with a wooden/bamboo stick or skewer, turn over the appams which have become golden. 10. do this for the appams which have become golden. 11. when the rest of the wheat appams are golden, turn them over too and cook all of them till crisp and golden. 12. you can even flip them once or twice back in the same mould for even cooking. 13. once done remove and place them in a casserole. in the casserole wheat appam stay warm for some time. same way prepare the remaining appams. the recipe makes for 40 whole wheat appams. you can store them in an air-tight box or container in the fridge. 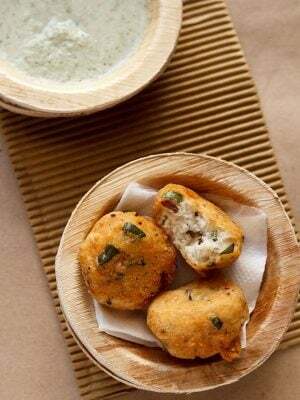 14. serve the instant wheat paniyaram, hot or warm or at room temperature. 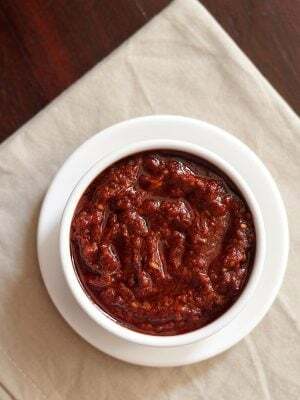 Your recipes always come to my rescue whenever I am in a fix about what to cook. I just look up here and I always find something great to cook! welcome priti and thanks. happy cooking. you can deep fry the appams. I want to prepare this early in the morning for my kiddo’s breakfast. 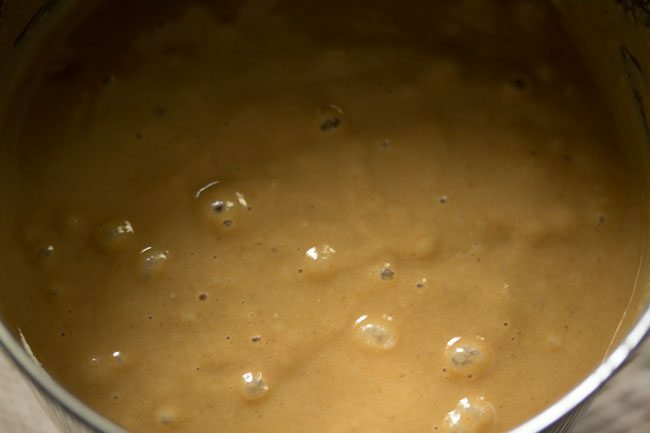 Can i make the batter ready and keep it in the fridge at night? Just want to save prep time during the morning rush hour. Thank you in advance. yes you can make the batter in the night and keep in fridge. also add soda to the batter before you make the wheat appams. I prepared these appams in ghee to offer as prasaad at my friends place for Ganesh chaturthi & it was a big hit! 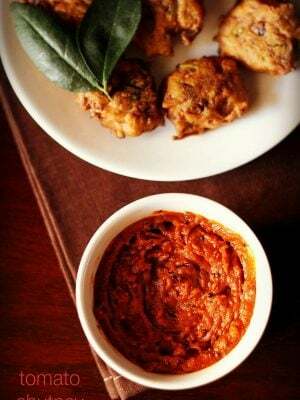 It is such a simple , quick recipe & delicious too! Welcome Radha. Glad to know this. Thanks for sharing positive feedback. Prepared these delicious appams as part of neivedhyam for Ganesh Chathuthi yesterday and there is a repeat order for this dish from my family. Thanks a lot for this yummmmmmy recipe. Have never fried appams in coconut oil before and that gives an excellent aroma to the appams. thanks aarthy for sharing this and i am so glad that your family liked the dish. yes coconut oil gives a good aroma to the appams. 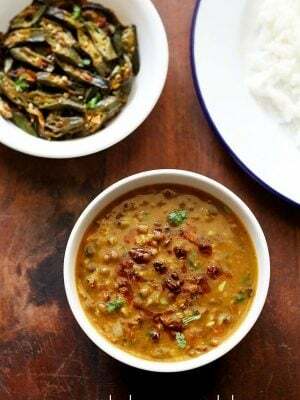 Nice and easy recipe This recipe is very similar to our regional food item called Gulgula made from wheat flour. We follow deep frying method to make that recipe. Thanks for sharing such a nice and healthy recipes. thanks and welcome abhineeta. i know. we also make gulgule at home. will share the recipe in some time. Looks yummy. would like to try this. Is blending essential? 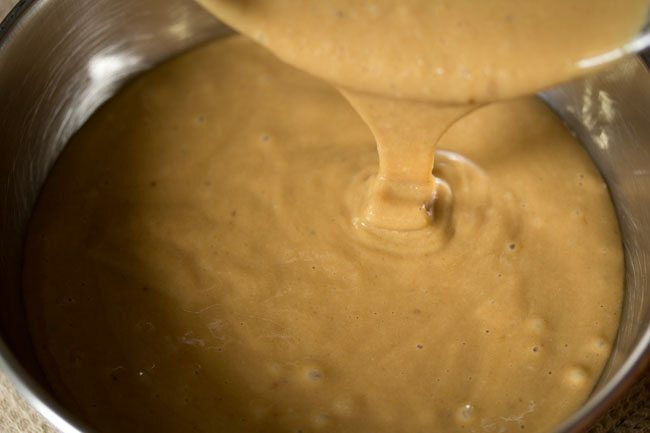 Can I mix the batter really well with a wired whisk? blending is not essential. you can just mix everything in a bowl with a wired whisk. Hi dassana, i tried these but the batter inside remained soft and uncooked. What went wrong here? these need to be cooked on a low flame. the ones in the center get cooked faster, then the ones at the sides. also the pan has to be slightly heavy and thick bottomed, otherwise the appams cook quickly from outside, but remain raw from the center. hope these tips help. 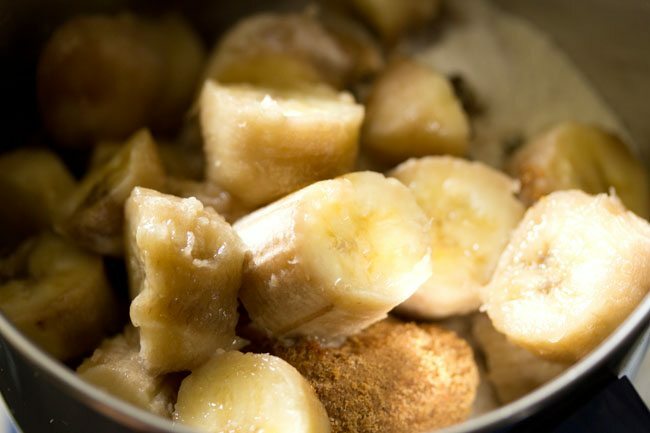 you can skip adding bananas. welcome diana. thanks for sharing this positive feedback. very pleased to know this madhavi, thanks for trying so many recipes. also thanks so much for kind words and positive feedback. the rice flour which is used here is raw flour or roast rice flour?? I will try this soon.. looks yummy….?? Thanks Mam..
Now a days I am researching on which appam stand to buy. Can you please suggest any good brand for induction cooktop? thanks. i sometimes use philips induction cooktop and so far it has worked well. Seems like a wonderful item to try. I am wondering, can this be done in an oven? 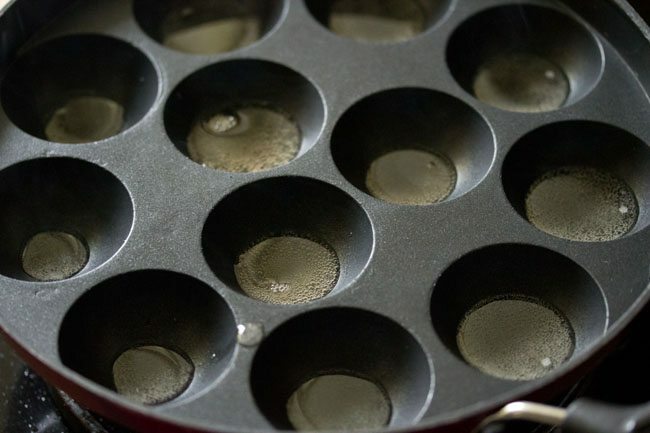 I have a muffin pan (very similar to the one you showed in your pictures) but it can not be kept on a stove for heating. If I have to use the oven, can you tell me at what temperature I should bake this? Thanks for your input. Keep up the great work! Dassana, thanks very much for your suggestions.